Spring is here and in Texas the weather is starting to get warm. I have been trying to come up with a bunch of healthy options for outdoor parties. I already have my Dairy Free Potato Salad and my Pineapple Mango Salsa. Now I have a macaroni salad to add to the list. 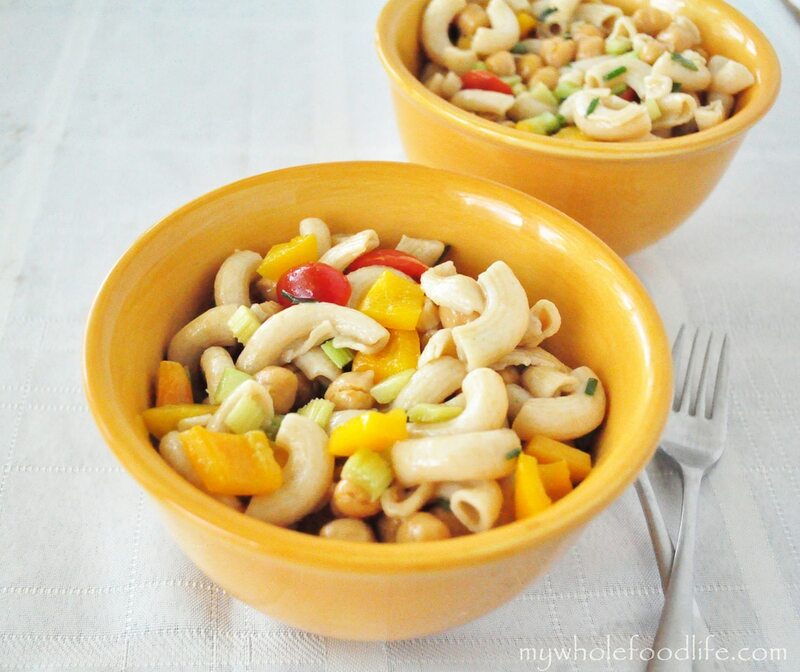 Most traditional macaroni salad is swimming in mayo. Not this. This is another meal that is really easy to put together. I used brown rice pasta for this recipe so it is gluten free as well. Since I added the chickpeas, it can be a complete meal and not just a side dish. The golden balsamic and the pomegranate molasses give it a slightly sweet taste. Both really make the dish. You can find the pomegranate molasses at most health food stores. Cook the macaroni according to the box instructions. Add all the ingredients in one bowl and mix to serve. This just gets better as it marinates in the fridge. I like it better the next day. It should keep for about a week. We got about 4 servings out of this. Enjoy! Gluten Free Herb Crackers and a Giveaway! This looks wonderful! I haven't been able to find pomegranate molasses without added sugar. Have you found a brand that doesn't contain added sugar or natural flavors? Thank you! My mother in law gets it for us at the Turkish market. She is Turkish. Ours only contains concentrated pomegranate juice. You may want to check at a Turkish market. It will most likely be cheaper there too. I live in Brownsville, Texas and don't know of a Turkish market anywhere near here. What is the brand name? It's called Cortas pomegranate molasses. Maybe you could get it on Amazon or Vitacost? Hi Melissa, I'd love to follow your blog. Is there a way to subscribe through email only and not through the wordpress blog reader? Thanks! Hi Question..... I keep reading all diff *views* about this. So, I came to YOU! Should WHITE RICE be rinsed A LOT to make it taste better, become MUCH fluffier, less sticky, AND somehow A TAD healthier? ? Do tell! What do YOU think? Thanks so much. I am not sure it will be any healthier, but you should rinse your rice. Also, adding a bit of oil when cooking it helps. Here are some tips I list. https://mywholefoodlife.com/eating-healthy-on-a-budget/ Can you grow some of your own food? That really helps as well. A colleague of mine gifted me a small bottle of Pomegranate Balsamic Vinegar that I think would work beautifully in this recipe. Thanks for the idea! You are so welcome! I hope you enjoy it. I also use the molasses in a tabouleh recipe I have. It really makes the dish and a little goes a long way! They are straight out of the can.